The ONE-HOUR Western™ Detection System is designed to produce high signal with low background for quick and clear western analysis of proteins. 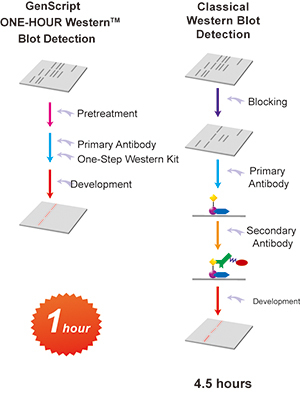 GenScript's breakthrough ONE-HOUR Western™ technology simplifies the classical western blot analysis by skipping secondary antibody binding and washing steps. The kits reduce the total western blot analysis time from 4.5 hours down to only one hour. Easy to perform: Quick and simple procedure. High sensitivity: The sensitivity of the ONE-HOUR Western™ is comparable to or better than that of the classical 4.5-hour procedure, depending on the quality and quantity of antibodies used. Less optimization needed than the classical method. No special labeling required for primary antibody. A comparison of the ONE-HOUR Western™ Kit to the classical three-step Western procedure is shown below. After protein transfer from gel to membrane, the users may simply incubate the membrane blot in the ONE-HOUR Pretreatment Solution for five minutes and then in WB Solution with their primary antibody for 40 minutes. We offer a selection of WB Solutions containing secondary antibodies to most commonly used primaries (rabbit, mouse, goat). After three five-minute washes, the membrane is ready to be developed. The entire procedure takes only one hour. ― Dr. Sarah Yohannan, Yale School of Medicine. GenScript provides a varity of reagents and related products for its line of ONE-HOUR Western™ Kits and ELISA Kits, including detection substrates, solutions and membranes. Shown below is a western blot detection of housekeeping gene product GAPDH protein using LumiSensor™ Chemiluminescent HRP Substrate Kit. Figure 1. 10 μg, 5.0 μg, 2.5 μg, 1.25 μg, 0.62 μg, 0.31 μg, 0.16 μg, and 0.08 μg of Hela cell lysate (BD Biosciences, 611449) were loaded into Lane 1, Lane 2, Lane 3, Lane 4, Lane 5, Lane 6, Lane 7, and Lane 8, respectively. The blot was developed with the LumiSensor™ Chemiluminescent HRP Substrate Kit. Western blot wash box and forceps.